Marketing research at Google first compiled search rankings. Merit and visitor preference both mattered. Balancing the two is still essential for ranking pages” appeal and relevance. Soon after, its studies also focused on service expansions and acquisitions. Like Amazon and Yahoo, Google’s platforms dually sought to net casual users and facilitate the growing “web 2.0” digital economy. What market segments should studies focus on? Further, should it include overlapping market segments? How will the study reach participants and interest them? What questions and should the research prioritize? Does the research help build into a staggered plan for improvements or expansions? How can tech and available data enhance research initiatives? Always pick study trajectories relevant to your goals. Examples of how to conduct research, though, are useful. Top companies like Google can access huge data sets and budgets. Their practices, goes without saying, are often the most effective available. Assessing the trends Google and similar organizations set at least informs you of popular methodology. First, the fun part; incentives. Google user research volunteers receive better compensation than average. While maybe a tad silly, attracting volunteers can be competitive. Best qualitative practices require “fresh” participants; those that do not regularly participate in studies. Including too many “stale” viewpoints is often ineffective. Think of a struggling eatery’s regulars taste testing for a different market. Such input won’t help the establishment know if their new fare will attract or retain their target market. Basically, Google is cornering a vast pool of “fresh” participants by offering gift and cash cards from $75 to $120. Such rewards are heads and tails above what most online research firms offer. Lucky contributors to Google studies can also receive further invites in the future. According to MoneyPantry, one such person noted they earned $300 in Visa cards over eight months. Such cash may not pay the rent but it has people, and most importantly not just fans, lining up to join the program. Applying to the Google User Experience Research program requires up to 20 minutes. Why? Complex user segmentation. Key to Google’s early and current success is focusing on specific users. For example, Google launched when search engines replicated layouts akin to Microsoft. Most were boxy and had numerous reference points. Google’s fun, multi-colored brand and simple search bar was a breath of fresh air. Those new to computers demonstrably found the initial page friendly and accessible. Initial use from brand appeal boosted Google’s data sets. This info further enabled them to augment search result quality. Schools, cyber cafes, and senior centers alike soon defaulted to it as the go-to search engine. Google continues this legacy today with vastly greater access to user preferences. Such differentiation applies to any combo of Google fans or prospects. This broad, but intricate strategy maximizes niche-specific appeal and its overlap. Such multimarket input is instrumental for guiding products’ overall direction. Market research has two goals. First, improve products. Second, learn about current or prospective customers/users. Google’s vast command of use statistics is ceaselessly expanding. Learning about how these stats develop, or how the company can guide them, requires a few different types of insight. Remaining simple, such data fits within two sets of opposites. Quantitative The numerical compilation of survey answers or other use statistics: time visitors spend on each page, items they purchase, customer inputs (such as sizing in the case of clothes), time spent in a brick-and-mortar store, time spent in an aisle, departments visited, size of visiting party and its members, etc. Qualitative This research type covers the interpersonal, typically from interviews or surveys that require written answers: how they feel about a brand, product, or website, what competitors seem similar, preferences regarding said foci, how it can improve or expand, if it appeals to their tastes, etc. Attitudinal How participants feel about their experience with a product or service and specifics as to why: the emotions it provokes, identities it conveys, appeal, potential, uses, etc. Behavioral How participants interact with a product; if they recognize its purpose and uses, how they interact with it, time between interactions, accessibility and noticeability of features, etc. Studies can focus on either data type, or both, and ditto for data range. In fact, a lot of user research is focusing on qual/quant (or is it quant/qual?). This is because the web can net segments of near any background or specification. Further, studies must also consider situational elements; the setting, time of day, collection of people if a panel, and similar aspects. Google determinedly seeks a major variance of study types. Research can be remote, at their main offices, or a different setting altogether. Depending on the business, you may want to employ all or a combo of the studies Google uses. Such research takes place in one of Google’s main campuses. It typically encompasses interviews or panel discussions in a shared, immediate space. On-location researchers can use any number of control schemas. Studies at a main office can range a great deal and may even include unannounced devices. Most studies on location are likely qualitative and this provides a few benefits. Namely, researchers can read and record total body language, not just what a laptop or phone cam portrays. The necessity of travel, though, as well as regional variety of participants and pace of research can suffer if businesses over-rely on this traditional method. Online exercises often focus on software. The participant usually explores a product or feature and then answers questions. Remote usability studies have dramatically increased in recent years. Heaps of platforms facilitate remote studies, such as screen recorders and feature rating tools. Observation remotely can lead to overemphasis on large, quantitative data sets. Tracking navigational input, though, only scratches the surface. Researchers must also survey and assess behavioral rationale. Remote studies are vital to keep pace with user expectations and product development. Usersnap, for instance, is refining collection of in-product on-screen written feedback with annotations. Web testing and design suggestions greatly benefit from this system. In turn, this better facilitates agile refinement of digital products. The value of remote data often depends on the research platform’s effectiveness. With the right utility, analysts can gracefully assess market segments’ screen navigation. Learn more about website visual feedback tools here. Participants use their mobile device to do software-based activities in different settings. They then offer user feedback to the researcher. Primarily it focuses on their experiences with apps in each scenario. Such apps could pertain to a certain industry or otherwise be for general use. Major advantages to experiential studies should be apparent. A variety of environments allow surveyors to gauge how much location affects interaction, usability, etc. Phone apps particularly require clear design for easy navigation. As such, they are typically the preferred device in this evaluations. Insight also helps refine applicable tablet and/or PC software. Researchers will visit participants’ select location and conduct interviews or panels about the setting and relevant products. Studies focus on how services or devices impact the subjects. Similarly, they examine what can further improve their situation. Field tests, like on-location inquiries, can drag on due to logistics. While they can add insight, agile development schemas should not exclusively rely on them. However, the data researchers gain can spark unexpected product improvements. Such analysis can also lead to altogether new services or devices. These typically feature both fill-in answers as well as questions applicable to quantitative data: multiple choice, yes/no, rankings, etc. Surveys are the most common type of qualitative marketing research. Their insight can be worthwhile if design is adequate. One step researchers should take, particularly for software, is verifying participants’ answers. A time-honored means to collect data, surveys are among the most convenient options available. However, other study types’ data has the benefit of multidimensionality. What to do if you only have $100 to spend on User Testing? 6 mistakes to avoid when collecting design feedback! Websites most often variate themselves off some basic templates. However, they are much more than just a mesh of rows, images, and columns. The semiotics of UX greatly affect user navigation. Imagery, semantics, icon and button placement, and overall clarity are essential for quick behavioral cues. Software services, meanwhile, must also consider how user interaction effects any number of variables. An interview with Josh Lewandowski, YouTube’s top UX researcher, explains Google’s use of qual/quant templates. 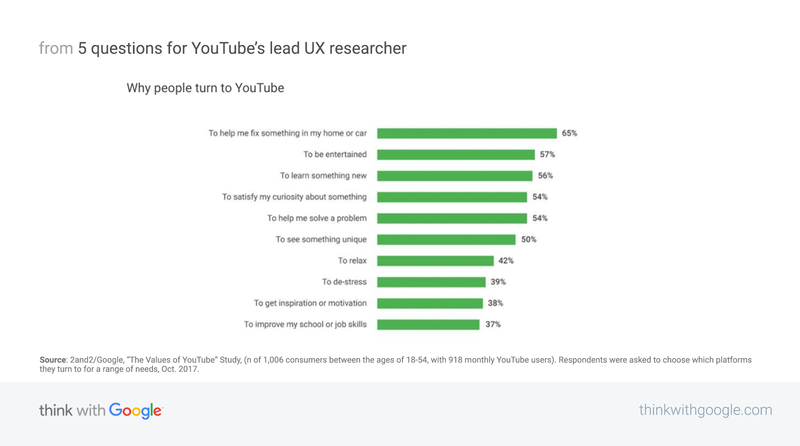 By streamlining the experience, for instance via automation algorithms, YouTube users now emphasize personalization of the service’s automation rather than searches. This change does not mean the service is orienting towards a “lean back” mentality, or for traffic to idle passively watching a video. Far from it. Youtube’s studies indicate dynamism and involvement matter a great deal. Interaction is a critical incentive for viewers. Comment sections are a basic example, as is polling. With such user input, channel creators and show producers can add greater reactivity. This typically spurs greater fan involvement. A “lean forward” mentality, Youtube has essentially combined media creation with its fandom. The result is both ends’ greater investment in the platform. Put simply, Youtube’s current schema is almost an evolved “Ask the Audience” system from Who Wants to be a Millionaire. Further, researchers can now better learn about the minutiae of visitor preferences through automation and UX planning. For example, tracking clip thumbnails and header phrasing is far more productive. Such insight can then be quantified and honed for max appeal. YouTube is also better enabling channel creators. The community features tab is a particular highlight. Through it, gleaning fan input is now more direct and productive. This is awesome for both channel owners and YouTube. Google’s user research programs can almost seem boundless. Like any cutting edge (and cutthroat) tech giant, they also keep most research specifics internal. However, what they do share is great advice for most organizations. First off, templates will most likely not change any time soon. Implications being what they are, at base tech consumers nowadays expect design both familiar and distinct. Current user research methods, as a result of UX improvements, must proactively engage their visitors and customers to gather unique insight. Google’s initial success proved familiar templates can differentiate through minutia; simplicity and brightness in their case. As they established, netting a fan base is clearly more than gambling on creativity. Decades worth of UX research has narrowed, rather than broadened, design schemas. Far from lack of inspiration, designers now know exponentially more about general user behavior. Design best practices still allow a great deal of variance, of course. But they now require considerable honing for a unique imprint. As the 2019 primer from UX Trends mentions in its “process” section, methodology is a good guideline. User research, however, is necessary for analysis. Via market input developers and designers are freer to explore productive creative options. Initial drafts’ applicable feedback can then guide improvements. Software products, SaaS, ecommerce sites, and even media services benefit. Greater intuitiveness enhances navigation, for instance. Testing aesthetics, meanwhile, increases brand interest and appeal. Be it enticing prospective customers or encouraging accessibility, pinpointing user habits and preferences is crucial. Usersnap is perfect for remote studies; its qual/quant feedback-oriented system of listen, learn, build, and evaluate makes a vast difference for UX designers and Product Managers. Risk significantly decreases without resorting to cookie-cutter templates. Instead, the platform’s features help establish unique, cohesive designs. Learn how you can smooth navigation and truly wow your users! Contact us for a demo today.